Most of us are looking forward to Easter Sunday. 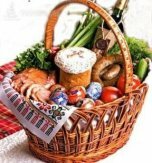 And in the pre-holiday time, every goodwife starts to think about what to cook in advance so that nothing is missed on the Easter table. But one should not forget that even the most modest dish tastes better when it looks aesthetically pleasing. 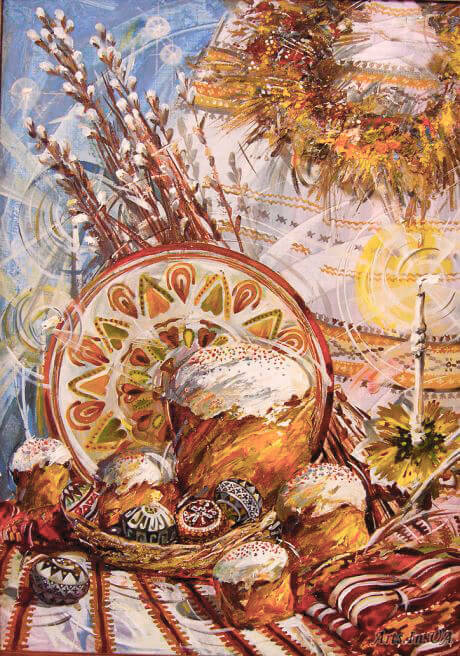 Therefore, today we will discuss how Ukrainian grandmothers served and decorated the Easter table, namely what was fashionable in the decoration of a festive table in the 30s of the ХХ century. For this purpose, we will use the advice of the popular at that time Lviv magazine about the native culture called "New Hut" («Нова Хата»). First of all, great attention was paid to the table linen. The table was covered with snow-white adamashka (a type of silk fabric) as well as linen tablecloth – a very solemn, starched table cover. Adamashka fabrics were considered too stiff so in time women began to lay linen tablecloths. Preference was given to colored tablecloths because they were more practical in view of the stains that could occur while celebrations. If a white tablecloth was covering the festive table then it was decorated with white or colored embroidering. Embroidery could be made in different places – along the edges or around the entire tablecloth, or just in the center. Most often, women made the damask stitch creating the impression of lace. The tablecloth was also decorated with the Poltava needlepoint. 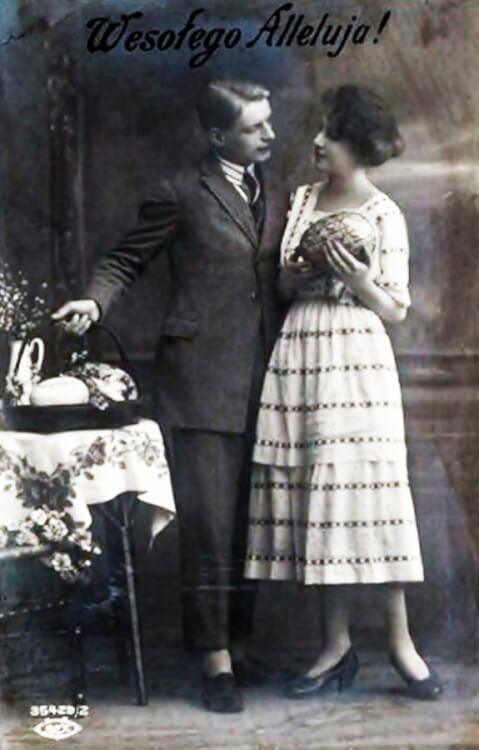 Lace tablecloths were also in fashion but they were used only for very lush, narrow circle celebrations. 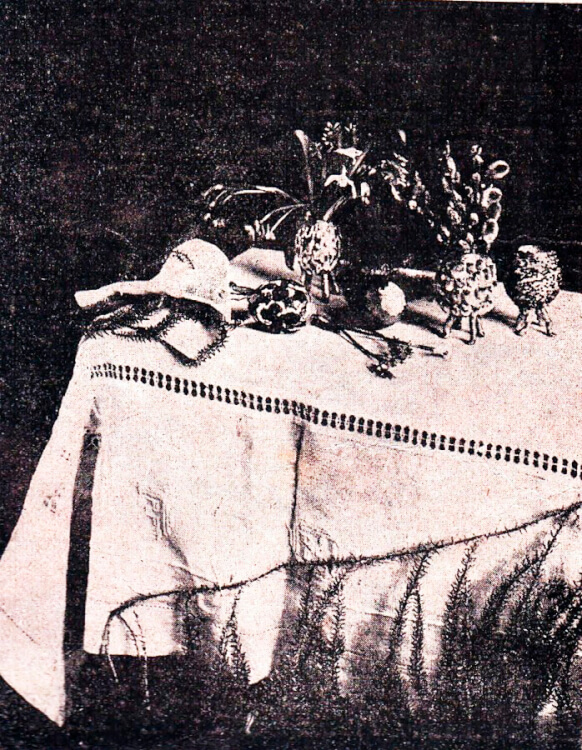 Sometimes the festive table was decorated in the American manner – one little tablecloth was put instead of a big one and certain “road” was put above, in the middle of the table. Yet, women decorated tables in such a way very rarely. In the 30s of the twentieth century, dishes decorated with flower patterns replaced white porcelain. Gradually, people also started to use delft ware. As for silverware, at that time plain and smooth dishes, without any small decorations became fashionable. The festive table was decorated in such a way that its very look was bringing festivity. To achieve this live flowers and flower pots as well as “stiazhka” (a decorative narrow strip of cloth) were used. Flowers and the vase were chosen to harmonize with other kitchenware. The Ukrainian workshop "Oko" which produced tableware at that time enjoyed high popularity among Lviv women. There were 2 Easter tables. 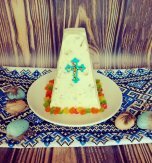 The consecrated food and sweets were put on the first one and the second one was used to eat the food. A tall, slim vase was put on the first table so that it was visible among high Easter pieces of bread and cakes, and on the second table, a low vase was put so that guests could see each other at the table. The flowers were picked up correspondingly to the shape of the vase. A bunch of willow branches was often put in a high vase, while in the low vase first flowers like snowdrops, forget-me-nots, or just fresh forest herbs were put. The flowers were selected in tone to the color of the tablecloth embroidery. The flowers of contrast colors were selected for the colorful tablecloth: violets for a yellow tablecloth, snowdrops for a blue one, fir needle branches for light-green linen. “Stiazhky” were only added to white linen to refresh the table. Herewith, the porcelain color or the color of the room itself was also taken into account. Often “stiazhky” were combined with flowers. For instance, two red tulips on the edges of the long table, and two red “stiazhky” of the exact red color, or pale hyacinths and similar cockades were put all the way around the table. “Stiazhky” were laid like this: the table was divided into rectangles with them. They were dispersed on four sides from the vase located in the center or they were thrown on a table in the form of cockades which had to be pinned from the bottom. Ready-made cakes were also decorated with bunches of fresh flowers. 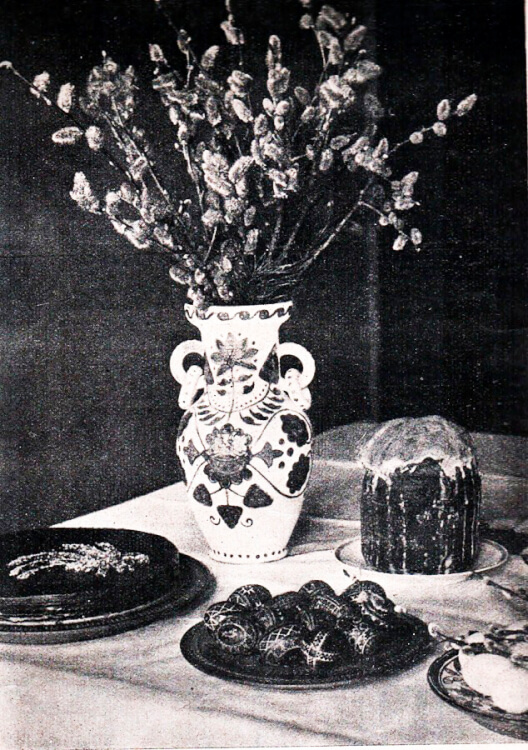 White or yellow flowers combined with fern asparagus were put on a chocolate cake, violets were used to embellish white or pink cake. Vegetables were decorated with branches of periwinkle or fern asparagus. The color palette of flower decoration was not recommended to be too motley. 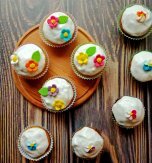 When the flowers faded (especially on cakes), they were unnoticeably replaced with fresh ones that were kept in water. 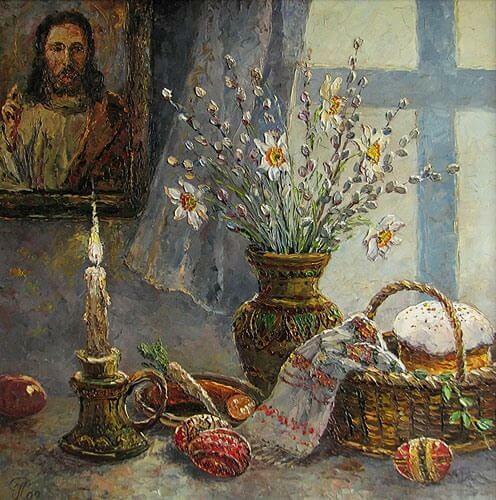 One more interesting Easter table decoration of Lviv goodwives was the shell of eggs. In order to make such a holiday decoration, it was necessary to spend a little more time. 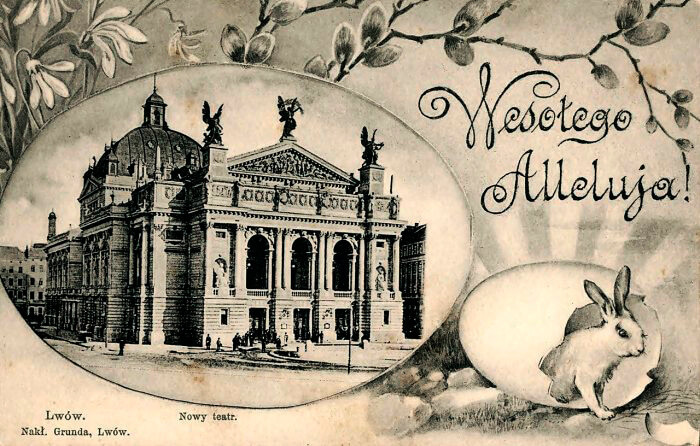 For this purpose, women took large eggs with a light shell. The egg was cleaned and washed out through the opening at the thinner end. Then the egg was thoroughly dried in the middle. The sealing was warmed over the candle and used to make four legs that were attached to the thicker end of the shell so that the egg could stand straight. 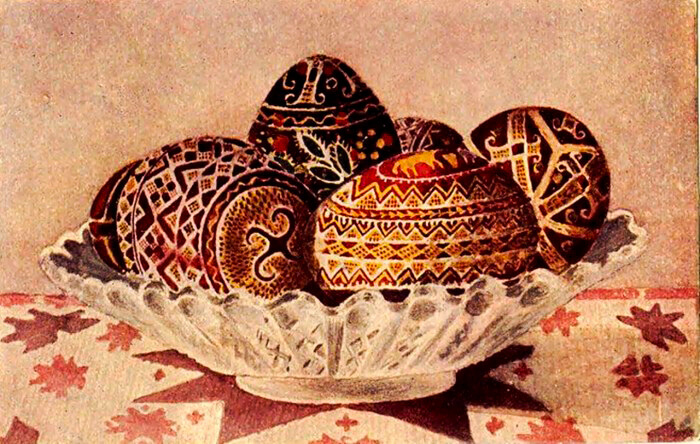 Then each shell was painted with a colored varnish, and after it could be decorated with glass coral or kittens. The decorated shells also were colored golden around the hole and legs so that no varnish was visible. Flowers like violets, small branches of willow or creeping myrtle were put in such “vases” and the vases themselves were used to decorate festive tables. Whatever method of decoration a goodwife used, the main sign of a successful festive table was the harmony - all details have to be looked a single inseparable object. 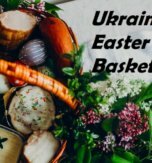 Have you liked the article about Ukrainian Easter table settings?